Neda Agha-Soltan has become a powerful and tragic icon of the new Iran--and an emblem of just how much women have lost in the thirty years of Islamic rule. As Iran’s government lashed out today at its foreign critics, people around the world were lighting candles and laying flowers at makeshift shrines to the political opposition’s first “martyr” in the battle against the hardliners of the Islamic Republic. In every way the unwitting victim, Neda Agha-Soltan, has become a powerful if tragic icon of a new Iran. She was a young woman of 26, and she died Saturday wearing tight jeans and running shoes, her head uncovered as she fell from the gunshot that killed her. Male strangers rushed to help her, ignoring draconian religious taboos. Iran’s religious leaders, who have barred public memorials for Agha-Soltan amid rumors that one was being planned for Thursday in Tehran, stepped up threats against would-be demonstrators and reiterated that the disputed election on June 12 that returned President Mahmoud Ahmadinejad to power would not be annulled and rerun. Some scattered protests continued through Monday night, according to online reports and videos from Iranians. International news agencies can no longer work freely in the country. The pervasive presence of women in street protests, and the influential political role played by Zahra Rahnavard, a political scientist and the wife of Mir Hossein Moussavi, the leading opposition candidate, have been cast into even sharper focus by the death of Agha-Soltan, though she appears to have been a mere observer to the upheaval. In suburban Washington, Mahnaz Afkhami notices the strong presence of women and is not surprised. In no small sense, these women are the heirs of Iran’s first feminist generation of the 1960s and 1970s, in which she was a leader. It was an era when Iranian women got the right to vote, were admitted to universities and professional schools and enjoyed the most liberal system of family law in the region. It was also the era of Shah Mohammad Reza Pahlavi, a reviled figure who died in wandering exile in 1980 after being overthrown by the Islamic Revolution now under assault. Afkhami was Iran’s first minister of women’s affairs, but because she was appointed by the Shah, her pleas to Western feminists to stand by the women of Iran after the Ayatollah Khomeini came to power in 1979 were largely rejected. She had been permanently tarred by the blanket condemnation of the Pahlavi era, a situation that still incenses her. It hit close to home. Among those who had climbed on the Khomeini bandwagon were leftist progressives, including her sister and brother-in-law, Marxists who joined the Islamic Revolution in the hope of a role in post-Shah Iran. Her brother-in-law was killed by the Khomeini regime. The pro-Western Shah was blamed for trying to modernize Iran too quickly. “It had nothing to do with him,” Afkhami said. “It was hundreds of thousands of women working hard for many years, arguing, negotiating, demonstrating–the whole gamut of things in order to bring family law change and other changes. The 1975 family laws which we had in Iran, even now after more than thirty years, can’t be matched by any countries of the Middle East, except for Tunisia. People have just not paid attention to that period.” The women of Iran, who had been active in the United Nations on behalf of women of the global South, were simply overlooked. How much the world has learned. How different the reaction, and feminist activism, have been to the Taliban. “From the beginning the entire philosophy of the Islamic Republic of Iran was a Taliban-like philosophy,” Afkhami said. “It was based on the complementarity of the roles of men and women, and gender separation, gender apartheid. They took 140 university majors away from women because they led to studies which were not considered appropriate and to jobs which were not appropriate. In schools, in public transportation, in public spaces there was segregation. Of course, one of the first things that happened was the annulment of the family protection law.” Family laws give women rights for themselves and over their children. Iranian women are still relatively well-educated, filling 60 percent of university places. United Nations agencies work with them in a range of programs, most successfully in family planning. Though they have been socially restricted, at least until they appeared in large numbers in mixed company in the streets and on rooftops in the last two weeks, they hold many jobs, can drive cars (unlike their counterparts in Saudi Arabia) and have pushed their dress code to new limits. The Shah appointed her minister of women’s affairs in 1975, and she held the position until he dismissed her and closed her ministry in the summer of 1978 as a sop to the rapidly growing Khomeini revolution. She criticizes the Shah’s regime bitterly for its ambivalent–she calls it “stupid”–strategy of savagely repressing dissent while appeasing Islamic militancy by getting rid of controversial programs. “I was the most controversial because women were at the center of the argument,” she said of her abrupt firing. 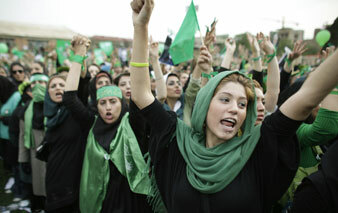 “Remember, Khomeini’s first uprising was against the franchise to women, in 1963. Two things he opposed: one was the women’s franchise, which he called prostitution, and the other was land reform.” The latter would have affected religious properties.